FILE - An Australian navy ship is seen at Changi Naval Base in Singapore, May 18, 2015. Australian warships were challenged by the Chinese military in the disputed South China Sea earlier this month, the Australian Broadcasting Corp reported Friday, citing Australian defense officials. The Australian Defense Department confirmed that three ships had recently traveled to Ho Chi Minh City in Vietnam but declined to comment on "operational details related to ships transiting the South China Sea." The ABC cited one official saying the exchanges with the Chinese navy were polite but "robust." "The Australian Defense Force has maintained a robust program of international engagement with countries in and around the South China Sea for decades," the Defense Department said in a statement emailed to Reuters. China recently completed a massive military drill in the South China Sea, where its claims are hotly disputed by Vietnam as well as the Philippines, Malaysia, Brunei and Taiwan. 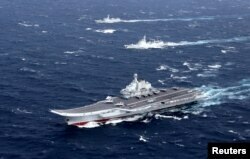 FILE - China's Liaoning aircraft carrier with accompanying fleet conducts a drill in an area of South China Sea, in this photo taken December 2016. Prime Minister Malcolm Turnbull, in London for the Commonwealth Heads of Government meeting, also declined to confirm the interaction between the Australian warships and the Chinese military, Fairfax media reported. "As they have done for many decades, Australian vessels and aircraft will continue to exercise rights under international law to freedom of navigation and overflight, including in the South China Sea," the Defense Department said. China's construction of islands and military facilities in the South China Sea, through which some $3 trillion in trade passes annually, has sparked concerns Beijing is seeking to restrict free movement and extend its strategic reach. The United States has conducted "freedom of navigation patrols" through the South China Sea, stoking tensions with China which says it will protect its sovereignty. The Australian navy ships Anzac, Toowoomba and Success are on a three-month deployment in South East Asia, which will involve exercises with a number of countries in the region, the Defense Department said in a separate statement on April 17. The Toowoomba sailed to Vietnam from Malaysia, while the other two Australian warships went through the South China Sea from Subic Bay in the Philippines.